Just as mammals shed their fur and reptiles change their skin, so do birds molt their feathers. Yet, for some reason, people are often surprised and even freaked out when they see a molting bird. There are even plenty of cases where new bird owners try to return their bird or bring her to a vet because of her simply molting. And while this is definitely ill-advised, it’s also kind of understandable – bird molting isn’t talked about as much as fur shedding or reptiles’ change of skin and as a result, some new bird owners get caught by surprise. There is nothing to be freaked out about, however – bird molting is completely natural and harmless and all birds do it. 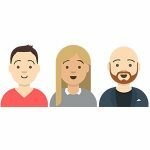 What are the different types of molting? What should you do while your bird is molting? Feather loss that isn't molting? Molting typically starts with the inner-most primary feathers and continues outwards. This means that the first feathers to go are the central flying feathers on the tail, as well as middle flying feathers on the wings. Because all birds are different, so are the molting signs you can expect to see. If you’ve just gotten a bird or you’re planning to get one, it’s best to familiarize yourself with all of its characteristics, including the specifics of its molting by checking out our species guides. Generally, molting is rather taxing for the bird in terms of the energy it requires. That’s why it doesn’t coincide with migration and breeding and usually falls between July and August for North American birds. For birds from other parts of the globe, the exact time may vary – many tropical birds molt after August and in September/November. Even just among North American songbirds, however, there are many differences – some do it before migrating south and others do it just after. Some species also have a winter semi-molt where they replace their head and body feathers but keep their flight feathers on the wings and tail. The size of the bird is important as well, since bigger feathers are harder and more energy inefficient to molt. According to Audubon, smaller species tend to molt once or twice per year, while big birds like eagles and pelicans molt only partially every year, replacing just their oldest feathers. 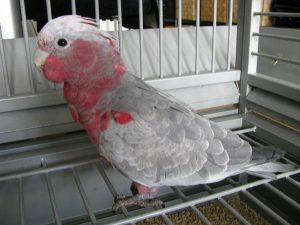 A male red-fan parrot with molting head feathers. Birds molt for the same reason a lot of other animals change their outer layers, be it fur, reptile skin, exoskeletons, and so on – simply because their feathers wear out. With feathers in particular this is very important, as birds use them to fly and not just for physical protection. 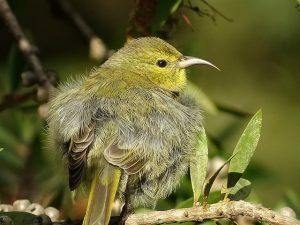 Activities such as rubbing into leaves and bushes, preening, dust bathing and just flying itself slowly damages the feathers and requires molting. Feathers are generally made out of keratin, which is the same protein that makes up our hair and fingernails. Unlike hair and fingernails, which regenerate and grow continuously, however, feathers can’t do that or they wouldn’t be suitable for flight. Hence – molting. Molting of Juvenile to Adult Birds. According to The Spruce, young birds have the so called “subadult plumage” that need to be shed as the bird reaches maturity. It’s during this “Juvenile” molting that birds get their adult coloring. In larger species, this type of molting can take several cycles as there are more and bigger feathers to molt. Breeding to Non-Breeding molting. Many birds that molt after breeding will change their feathers into more camouflaged colors for protection. Non-breeding plumage can also include more feathers for better insulation during the winter months. Non-Breeding to Breeding molting. In preparation for the breeding season, this type of molting often results in brighter and more colored feathers which help with attracting sexual partners. General Feather Change. Many species of birds don’t care about changing the color of their feathers for camouflage or for mating, and many others don’t need winter insulation when there’s no winter season in their region. However, general feather changes are also happening and feathers need to be molted. An immature female galah that is molting it’s feathers. The grey ones will become pink whereas the back and flight feathers will remain grey and her wings will have white patches. While molting is necessary, it is not without its risks, especially in nature. While they are molting, birds have troubles flying, which means that they are both defenseless and face difficulties finding food. Additionally, they need extra nutrition because of how energy exhausting molting can be. Give your pet some extra nutrition. Cucumbers are a great treat you can give to your bird during this time. Any other good protein source is also a great idea. Adding extra vitamins and supplements to your pet birds diet is helpful. Allow your bird some extra rest. We love to play and communicate with our birds, but during molting it’s essential to give them some extra space and time for rest. A bird cage cover can help your bird to get some extra shut eye. Give your bird some bathing opportunities. This is true throughout the year as a whole, but during molting season, birds love to bathe. After all, so would we, if we were plucking feathers out of our skin for days. Feather loss that isn’t molting? 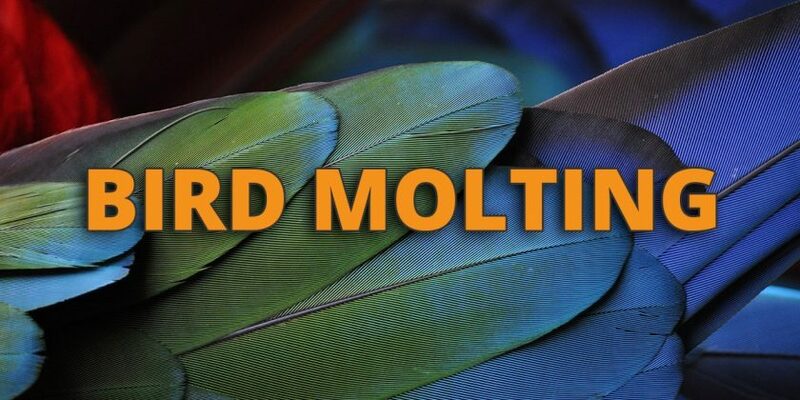 Molting is a natural process that every bird owner should become familiar with. However, it is different from feather loss that is the result of plucking. To understand the difference between molting and feather plucking, check out our article on feather plucking. 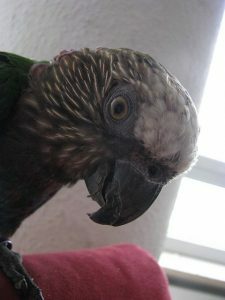 Feather loss can also be a sign that your bird is sick or lacking nutrition, you should keep an eye out for feather stress bars and also any other signs that your parrot or pet bird is sick.